HomeWhat’s on your wish list? Tinker station. Encourage hands-on, minds-on creative thinking by providing tools for tinkering. Stock a “maker” station with everything from Legos to kits with wires, switches, and batteries, to a sewing machine. Add a library of Make, Craft, and Popular Mechanics magazines to get creative juices flowing. Video booth. Turn an empty refrigerator box into a three-sided video booth to capture student reflections. In one class, students created posters on the interior walls that evoke the themes of each project. You might set up lighting and a video camera on a tripod, or just arrange for video capture through a webcam. Color. If you have the option of changing wall colors in your classroom and school, investigate the role of color on minds and bodies. Better yet, have students investigate and make color recommendations as part of a project. Furniture. As with color, furniture affects body and mind. 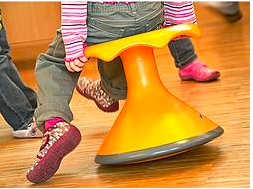 Kids have a natural inclination to move, and ergonomic furniture designs (round-bottom stools or shell-shaped chairs that rock) accommodate rather than suppress movement. Beanbag chairs invite students to settle in for reading or quiet work. I have been experimenting with furniture over the last few years. This year I brought in 10 large balls which the students could use instead of chairs. 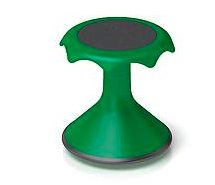 There are pros (allows rocking, bouncing, moving, fidgeting, encourages posture, engages core muscles) and cons (they squeak when rubbed against shoes or desk legs, they seem to have a life of their own and end up rolling around the classroom). I would love to try these Hokki Stools. They allow movement, rocking, twisting, and they are quiet, don’t take up a lot of room and easy to relocate when learning spaces need to be changed. These stools are on my wish list. What is on your classroom wish list? I want more cushy areas in my classroom. Bean bags would be good. Love the idea of color on the walls – I try and do this via artwork. Those stools look awesome. I have a couple of tall tables with stools and low tables by windows – some of my kids like the ‘solitude’ these spaces provide. Headphones are also a good thing to have for those people who like to have a little more quiet focus. We tried to source Idea Paint here in China with no luck. I love the idea though, so we’ll keep looking. I think stools by the counters would work. Thanks for that idea. I am considering moving some tables out of the room to make more space as we don’t often all need to be sitting at tables at the same time. I need to talk to the students about it. I’ll let you know what we decide. It’s Patricia (Karen’s friend). I have been checking your website since we met in the summer and am loving it! I won a Hokki stool at a conference I attended last spring. It finally arrived last month and is wonderful – I would love to be able to get a few for all of our classrooms. Students who use it stay focussed for so much longer (I bought myself an adult-sized version as well..great for building core stability 🙂 ). Another great movement option is a child-sized stationary bike. See http://www.self-regulation.ca/sparks-fly. Luke MacDonald, who owns a sports equipment store in Halifax, has been working madly to fundraise to get these bikes into schools. I’ve been fortunate enough to have one in my office as a demo…we can’t wait to have more of them in the school! Thanks so much for sharing all of the great info on your website – it’s much appreciated! Lucky you! I am still looking for a way to get some into our school. Shipping to China at the moment doubles the cost. Very interesting about the bikes. Can you send me photos? On another note, I have always been inspired by Karen and you with your running. I took up running this August and ran my first half marathon in Shanghai yesterday! It feels great. Are you on twitter? I’m @marinagijzen. Follow me and I’ll do the same. I need to get back to writing another post. I’ve been busy here. Did you know that I will be head of primary school next year? More to talk with you about!